It is often said that size doesn't matter...however I have a problem here. 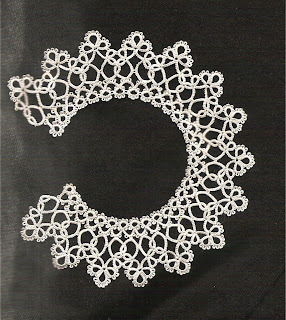 My collar, made from the pattern Eunice in Lyn Morton's book "Tatting Patterns", is very pretty but it would probably be rather tight on a baby! It just fits around the base of a wine glass. I guess the silk thread is rather finer than the size 20 Altin Basak thread that she suggests. I have no idea how one might adjust a pattern like that to make it bigger...I will have to try a different pattern. This motif come from Myra Piper's book and is called "Forget-me-not". Here I was using a fine silk thread, perhaps 100? Anyway although I had previously made this pattern in a larger thread with no problem, in this size the outer round just didn't fit. P.S. look TattingChic, for once I actually sewed in those ends on the collar! The collar is beautiful! If it's too small for a baby, maybe it could be used for a special doll, then your beautiful work could be displayed. LOL! It looks divine (with the ends sewed in!!!) LOL! YAY!!! You could put that collar on a doll? Like a nice porcelain doll maybe? It's absolutely gorgeous. Your motif is lovely, too! Yes, I've got a few things to send off to Sherry, myself! The collar is beautiful, I like the idea of putting it on a doll to show it off. Happy New Year and great tatting. Your collar is beautiful! I think I would really look nice on a pillow made out of an elegant pastel fabric. Just my thoughts. These are just beautiful. 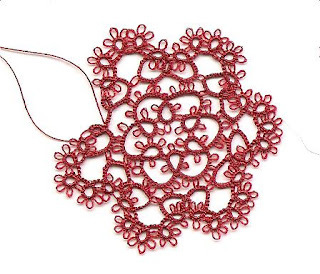 I had never heard of tatting before I started reading the blogs here. I would love to work it into my beading. Thanks for sharing your pics!